"Florida's Most-trusted Premier Trike Conversion Superstore." 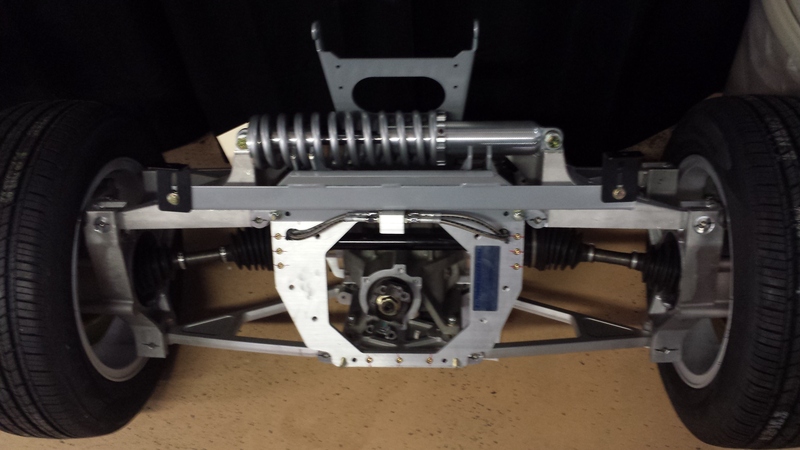 A California VIPER Independent Rear Suspension (IRS) mono-shock technology in stock waiting for your GL1800. "LOWER THAN EVER" Starting price @ $11,490 includes: A COMPLETE CHASIS EXTRA-LARGE CARPETED TRUNK PLUS OVER-WHEEL STORAGE (8 cubic feet), BODY WITH COMMON METALLIC SINGLE-COLOR MATCH LOCALLY TO YOUR BIKE COLOR, 15" SLIT 5-SPOKE MACHINED RIMS, SHIPPING & CRATING, AND INSTALLATION WITH the "First in the Industry" 5-YEAR/UNLIMITED MILES SUSPENSION FACTORY WARRANTY ~ ASK ABOUT THIS WEBSITE SPECIAL! Can't stretch your Long Legs on your GL1800 Gold Wing? Ask us about our Tall Rider Stock Seat Modification allowing you to position yourself up to 3 inches back from standard seating position, starting @ $250; Driver Mini Boards with a 3/4 inch Drop-Style lowering bracket, starting @ $120; as well as a complete Lowering Confort Packgage which takes your stock controls and moves them forward 3" and down 1" resulting in an extended knee position, starting @ $699! Ask for details and installation cost. Our reputation speaks for itself by selling trikes with low miles and in pristine condition while offering rock-bottom pricing on all used trikes on our lot! FOR MORE INFORMATION OR PICTURES ON ANY OF THE TRIKES LISTED BELOW, PLEASE FEEL FREE TO CALL OR EMAIL A REQUEST. Once a VIT customer you will receive a Wing Heaven 10% discount with FREE install on eligible in-store items at time of Trike purchase and during conversion. And as always, VIT customers receive discounts on future service and purchases throughout our facility. And Another Arrival **$24,500** ~ 2008 GL1800 with CSC VIPER TRIKE KIT ~ 24K+ miles. This California mono-shock independent suspension system with a longer wheelbase and 6o PowerTrak steering assist will smooth the roughest of roads, while providing responsive handling. Still remaining is 4 YEARS/UNLIMITED MILES WARRANTY. Wing Linked Brake System Retained, Adjustable Pre-Load for ride handling. This Caliente Red Goldwing Trike has Navigation along with all the standard features: Electric Reverse, Cruise Control, Audio Package to include AM/FM Stereo, Intercom, Weather Band; Auxiliary for your SmartPhone or MP3 Player and or CB. Cold-Weather Comfort Package with Heated Seat & Grips, Cold-Weather Comfort Package, Adjustable Pre-Load for ride handling. Added items include: 17" Machined Directional Rear Wheels, Chrome Wheel Well Trim, Fender Bras, Cruise Pegs, Fog/Driving Lights; Chrome Luggage Rack, Driver Back Rest, Passenger Arm Rests, CB antenna only & Carpeted Trunk. TOUR WITH SOPHISTICATION AND COMFORT! Another Arrived **$29,900** ~ 2013 H-D RED ULTRA CLASSIC CSC DAYTONA TRIKE ~ 14K+ miles. this California mono-shock light-weight independent suspension system with a longer wheelbase and 11o PowerTrak steering assist will smooth the roughest of roads, while providing responsive handling to the driver and most comfortable ride for the passenger. This Anniversary model includes: Powerful Air-Cooled Twin Cam 103, 6-Speed, Cruise Control, Navigation, AM/FM Stereo, Intercom, accommodate Cd or MP3, ABS brakes, heated hand grips. Daytona Kit includes; Electric Reverse, Ground Effects, Light Bar, Chrome Rear Wheels, Performance Brake Upgrade, Chrome Wheel Well Trim. In addition: Driver Back Rest, cruise pegs, 3 luggage racks for travel bags or your furry pooches. IT IS SIMPLY EXHILARATING TO RIDE! Also New to the Lot **$40,000** ~ 2013 Harley-Davidson CVOâ„¢ Ultra ClassicÂ® Electra GlideÂ® (FLHTCUSE) Silver 3-Tone Screaminâ€™ Eagle with CSC Daytona Trike has only 33K+ miles. This California mono-shock light-weight independent suspension system with a longer wheelbase and 11o PowerTrak steering assist will smooth the roughest of roads. This 2013 Harley-DavidsonÂ® CVO Ultra Classic Electra Glide model is a high-end performance motorcycle powered by a HarleyÂ® twin cam engine with Screaminâ€™ Eagle Badges that provides 110 cubic inches of power, a low cruising rpm, and lots of low-end torque; setting this bike apart from the rest is the granite powertrain. The model has serialized 110th Anniversary Special Edition, features exclusive commemorative anniversary styling elements, premium features and finely forged finishes that make it a top-of-the-line model and a true work of motorcycle art, including upgraded high-performance audio speakersâ€¦BOOM! Take a good look at all of the premium features and components of this Powerful Air-Cooled Twin Cam, 6-Speed, ABS brakes, Cruise Control, Navigation, AM/FM Stereo, Intercom, accommodates CD or MP3. The seat and grips are heated for an ultra comfortable ride in cooler weather. Daytona Kit includes; Electric Reverse, Ground Effects, Light Bar, Trike Spoiler, Chrome Custom Front & Rear Wheels, Performance Brake Upgrade. In addition: Loaded with SCREAMINâ€™ EAGLE Bling, Air Wings, Driver Back Rest, Cruise Pegs, Passenger Armrest w/Cup Holder, Trailer Hitch & Carpeted Trunk. IT'S SIMPLY INVIGORATING TO ADMIRE & RIDE! 2018 Agility 125 *$1,799.00 ~ BLUE Agility 125cc-Automatic Motor Scooter with introductory discount pricing through February 28. (includes FREE freight, dealer prep, and 3-year warranty.) Best to check this out before the demo is gone! 2018 LIKE 200i *$2,249.00 ~ WHITE LIKE 200cc-Automatic Motor Scooter with introductory discount pricing through February 28. (includes FREE freight, dealer prep, and 3-year warranty.) Best to check this out before the demo is gone! XTOWN 300i ABS *$3,599.00 ~ GRAY XTOWN 300cc - Automatic Motor Scooter with introductory discount pricing through February 28. (includes FREE freight, dealer prep, and 3-year warranty.) Best to check this out before the demo is gone! **$990** ~ 2009 JAYCO ROCKET TRIKE/MOTORCYCLE TRAILER ~ Aluminum Extrusion, stainless steel bolts, pins and nylock nuts. Overall Length 107"; Overall Width 60"; Deck Width 40"; Folded. 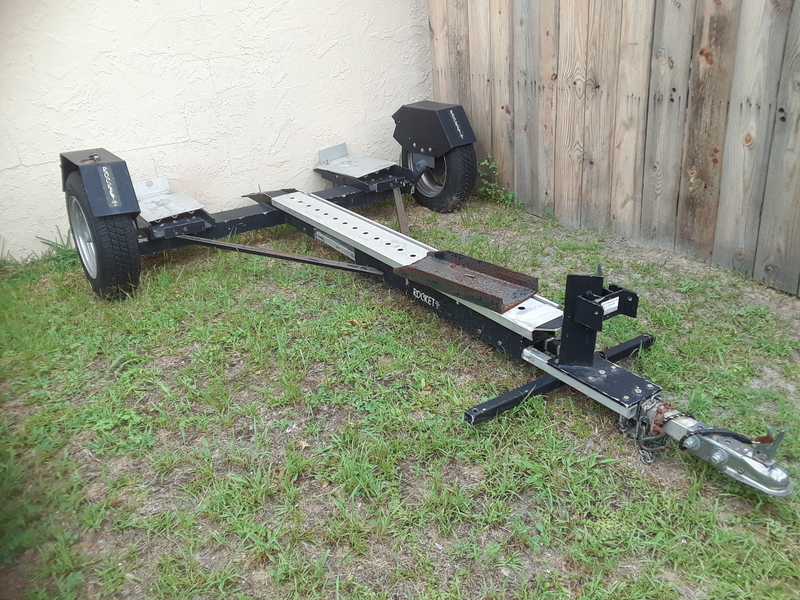 Height 77"â€™ Motorcycle Wheel Base; Up To 69"; Ramp Width 8"; Tire Size P175/80R13â€™; Approximate Weight 240 lbs; Trailer Hitch Ball Height 16â€� to 18â€� to top of ball; Self-Locking Chock; Made in the USA. Haul your trike, bike, ATV, personal water craft and MORE in the back of your Pick Up Truck! No More nuisance ramps or breaking your back!! *We are a DMV dealer, therefore will handle your 6% Florida Tax, appropriate County Surtax, Title & Tag Requirements with Administration Fee. Ads reflect CASH / NO TRADE / LOCAL PICK-UP CONSIGNMENT PRICING. Ads can be changed or canceled at our discretion, at any time, and not responsible for misprints on prices or details. NEW means the Trikes bike portion and/or conversion kit has most or full factory warranty. * It is the buyer's sole responsibility to thoroughly inspect the vehicle and to compare description to the trike whether in person or through photos provided. * It is the buyer's sole responsibility to notify Trikes by Design of any discrepancies between whatâ€™s viewed and what is noted in its written description. * It is the buyer's sole responsibility to verify the accuracy of the prices with Trikes by Design. * It is the buyer's sole responsibility to have satisfied himself or herself as to the condition and value and to purchase based upon that judgment solely. * If purchase transaction is not to be finalized in person - It is the buyer's sole responsibility and expense to arrange shipping and is required to provide documentation to Trikes by Design a minimum of 5 working days prior to scheduled pick-up (Additional Handling Fees are required to seller). Licensing in another state still requires 6% Sale Tax to the State of Florida in addition to any other taxes or fees required by the registered state. All Title & Tag registrations and their expenses are the sole responsibility of the buyer. * Trikes by Design assumes no responsibility for any repairs regardless of any oral statements about the vehicle. Trikes by Design will make every reasonable effort to disclose any known defects associated with this vehicle at the buyer's request prior to the close of sale. JUST SOLD ~ THIS GEM HAS BE REDUCED **$12,900** ~ 1997 GL1500 ROADSMITH ~ This newly painted 2-Tone Pearl White & Gold Metallic Roadsmith Trike with Pinstripe Detail has independent suspension, 58K miles, 6o Steering Kit, 9-gallon auxiliary fuel tank, park brake, LED Mud Flaps, brand new AM/FM & CB radios & Windshield, Trunk Spoiler, Carpeted Trike Trunk, Chrome Rear Bumper, Trailer Hitch. Driver Backrest, Cruise Pegs, Heel-Toe Shifter with Floorboards, Front Wheel Chrome Rotor Cover & Fender Extension. 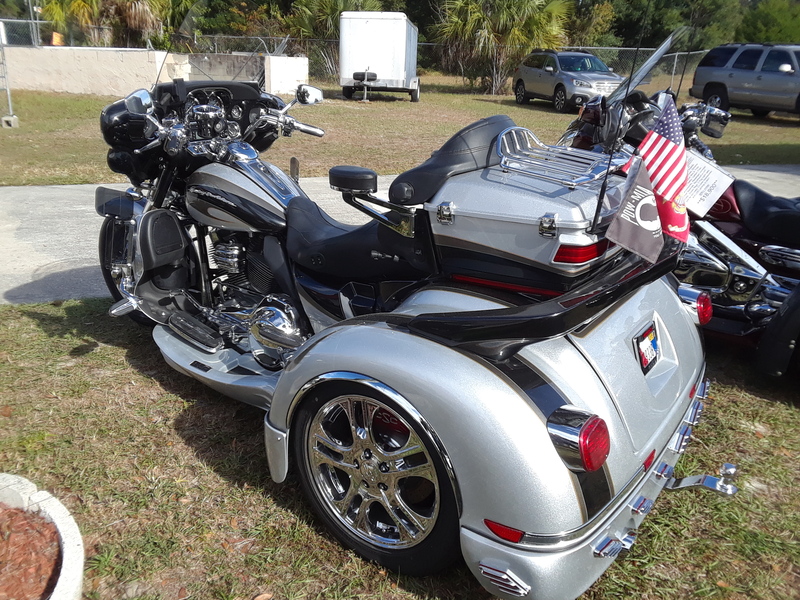 SOLD BOTH ~ BIKE WEEK SPECIAL **$18,900** ~ 2008 CABERNET RED GL1800 MOTORTRIKE IRS with 90K+ miles AND **$3700** 09 ESCAPADE TRAILER ~ Gold Wing standard features: Linked Braking System, Adjustable Pre-Load for ride handling, Electric Reverse, Cruise Control, Audio Package to include AM/FM Stereo, Intercom, Weather Band; Auxiliary for your SmartPhone or MP3 Player. 4.5o Steering Kit, Aqua Shields w/Fog Lights, Rear Black Spoke Wheels, Chrome Front Wheel, Upper Box & Trike Spoilers, CB Radio, Carbon Fiber design accessories. Passenger Armrest, Driver Backrest, Floorboard w H/T Shifter, Cruise Pegs, Chrome Front Lower Cowl w/Fog Light, Trailer Hitch (and matching Escapade Elite Trail sold separately) Loaded with BLING: Custom Pinstripe Detail, Driver Back Rest, Driver Cruise Pegs, CB Radio, Fog/Driving Lights, Upper Trunk Spoiler, Passenger Armrest, Infinity Lights, LEDs & other Lighting. Lots and lots of Bling - too many to list!!! A BEAUTIFUL COMBO. Click here to visit Trikes by Design for Parts, accessories & clearance items.